The Daimyo gyoretsu (大名行列, Daimyo procession and matsuri) is held in Hakone Yumoto onsen town on the national holiday of November 3rd which is Culture Day. The Daimyo gyoretsu (Daimyo procession and matsuri) is held in Hakone Yumoto onsen town on the national holiday of November 3rd which is Culture Day. There is a procession of 170 people dressed as Samurai, their attendants, Geisha and equipment bearers. The parade covers a distance of 6 km in the onsen town. The Samurai retainers, armed with spears, bow and arrows, or guns, march through the streets of the town as they carry their lord in the palanquin to the words, 'Down! Down! The Lord comes!' which is shouted out loud. The procession is a recreation of a common sight - the Daimyo Gyoretsu - which took place during the Edo period (1603-1868). 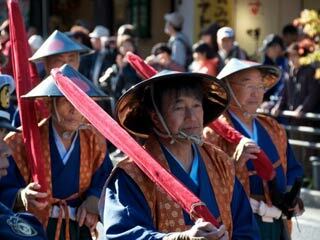 The Daimyo Gyoretsu were feudal lord's processions and were also termed sankin kotai. The sankin kotai was a military service to the Shogun. With hundreds of Daimyo entering or leaving Edo each year, processions were almost daily occurrences in the capital. The Daimyo gyoretsu or sankin kotai was a system established by the Tokugawa government to prevent its subordinate feudal lords from rising in rebellion. By obliging the Daimyo lords to go back and forth between their domains and Edo (present-day Tokyo) in alternate years, the government aimed at weakening their financial power. The requirement was that the Daimyo of every province move periodically between the capital of Edo and his province, spending alternate years in each place. His wife and heir were required to remain in Edo as hostages. The large costs of maintaining residences in both places, and the cost of the procession to and from Edo, placed considerable financial strains on the Daimyo making them unable to wage war. The frequent travel of the Daimyo and their large retinues encouraged road building throughout the country and the construction of inns and other facilities along the routes, generating economic activity. The Hakone Daimyo Gyoretsu departs from Sounji temple at 10 o'clock in the morning and travels the 6km of the course arriving at Yumoto Fujiya Hotel, the final destination, at around 2.30 in the afternoon. There are performances by marching bands and dancing girls and by geigi who are unique to onsen resorts (geigi are women who entertain guests at sake parties with song and dance).